Have you ever had the need to find information online, but were stumped because all of the sites that appeared in the search results didnâ€™t provide the information you actually needed? Sometimes the really good stuff is found within PDF files that are scattered on the web. For example, say you are working on a paper and need information about marketing research, rather than searching for marketing research you could search for marketing research pdf or better yet marketing research filetype:pdf using Googleâ€™s search. Youâ€™ll be amazed at the difference and quality of the search results when using this method. 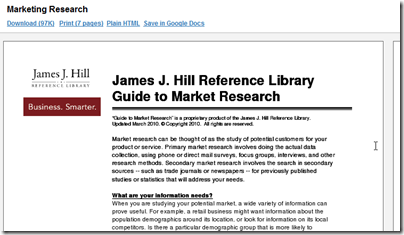 I used the example of marketing research above, but you can easily search about any topic followed by research pdf or research filetype:pdf and you will find that there are a ton of resources that will make your research and finding sources much easier. In the guide below I will show you how to search for PDF files using Google. 1. Enter the search terms (highlighted yellow) followed by filetype:pdf. A. You will notice that the search results title will be preceded by [PDF] indicating that the link leads you to a PDF file. B. If you want to preview the PDF before downloading, click on the Quick View link (when available). The preview will open in a separate browser window using the Google Docs viewer.